Driving in Turkey has got a colourful reputation and foreigners gasp at the total disregard for safety. Many first time visitors to Turkey will stand on the pavement( if there is one) for about five minutes just staring at the traffic. Their mouths fall open and they seem to think their eyes are playing a trick on them. They are not. No doubt you’ve heard of “when in Rome do as the Romans do”. So read on and learn how to drive like a Turk! Never assume that you have right of way, even if the law says you do. Right of way will depend on whether the other driver is in a rush, has a dentist appointment or he just assumes he is the only driver on the road. It will soon become clear that when driving in Turkey, traffic lights are a waste of time and money. No one pays attention to them , unless a police car has pulled up besides them. If you decide to pay attention to the lights, then be ready for a line of cars behind you, hooting their horns when the lights turn from red to orange. They are simply put in cars to confuse the driver and have nothing to do with safety. They have no purpose on earth. So what if the other driver can not anticipate your next move. It keeps them on their toes. Even if you use your indicator to turn left, expect the driver behind you to overtake you on the left to go straight ahead. Remember indicators are useless. Approach them at your own peril. Know the person on the inside lane will suddenly cut across in front of you, to turn off. Know that when you are coming off the roundabout, there will be a pedestrian crossing there. When you nearly run the pedestrian over, you will get abuse from them, as well as the other drivers who have gone into the back of you. They are a world unto their own. Drive a moped without a helmet and you will only be stopped by the police if he is bored and has nothing else to do. Under no circumstances should you point out to the police officer, that he does not wear a helmet himself.! If you want to fit your whole family on the moped and drive into town, then feel free to do so, you will just be keeping up with the Joneses. Never attempt to get from A to B by using a map. They are non-existent in Turkey and the ones that are sold are twenty years out of date. If you ask any local shop keeper, they will draw directions on a napkin, which he will then use to wipe the sweat off his forehead. If your friend is driving towards you from the opposite direction then it would be rude not to say hello. You must stop the car in the middle of the street, wind down the window and discuss how the family is doing. If any cars behind you start beeping their horns, don’t worry because karma will catch up with them. This is an interesting concept of which you will never get your head around. There are either a lot of parking spaces or none at all. Feel free to ignore all parking spaces and safety rules if you are in a rush though. Instead leave your car in the middle of the street with the engine running and door open, run into the shop, have a chat with the owner and then run back out to your car. Wave to all the frustrated drivers who have lined up behind you, get in your car and simply drive away. Whilst traveling on a long journey, you will see cars flashing their head lights at you. This is to warn you that a speed camera is ahead. The speed camera is actually a police man sat in a plain car which is meant to be discretely hidden. Resist the temptation to wave at him when you drive past. Around 1000 meters up the road will be another marked police car, and whether they stop you will depend on whether his wife let him have marital nuptials the night before. An on-the-spot fine will be issued of which the police officer will add another 50 lira, so that he can take his mistress out to dinner. One last tip is to remember we drive on the right here. Enjoy yourself. Hi. I'm Natalie, a freelance travel blogger and writer specializing in the country of Turkey. I love hot summer days, historical sites and coffee. Hi Songul, Road conditions in major areas have definitely improved and the police are more strict re drink driving and speeding etc. However still be aware in some of the more remote areas and resorts as not a lot has changed there. Planning to move from Australia back to Turkey next year, im moving before hubby does and have been researching life in Turkey /samsun. I know how ummn impatient turks can get and know how bad traffic was in 2005 – but i also hear about the improvement carried out by the the prime minister and how the roads and traffic has improved. Just as i was building my confidence to be a female driver in turkey reading your article i have my doubts again..
Georgina – I have driven in Marmaris and i think they are all mad. The roundabout near the harbour used to be a deathtrap. I hooted with laughter reading your post because it is ALL so true! I now drive a scooter in Marmaris and reckon that every time I get on it every potential hazard will happen, I have never sworn SO much as when I am going from a – b. The roads are rubbish, people wander onto the road and just expect you not to hit them, as well as walking down the middle of the road, drivers do what they want and I can not say how many times I have yelled “have you not read the highway code?” Do they even have one? So now I go the wrong way down roads and onto pavements – when in Rome…… But do I need to have a Turkish driving licence as I live here????? Yes, I forgot about the lanes as well joy. Lanes instantly appear from the middle of no where! Flashing lights in the left lane behind you can also mean, I’m coming, so don’t attempt to pass in front of me. Robyn, that sounds so stressful! I have given up owning a car in Turkey. I got used to the driving but the fuel and tax prices were just going up and up. I also can believe that the young Turks that crashed into you did not have a licence. Seen that many times!! After a 5-day drive through France, Italy and Greece (2600 miles) to get to Turkey with my two Turkish Vans in the car, and a further 6 months driving a RHD car here (I had to surrender it to Customs when its 6 months allowed stay was up), I can attest that I have expereinced almost all of the above – the only drivers who came close to the Turks in terms of driving were the Italians on the Tangenziale in Bologna who thought we were in a no-holds barred motor-racing event! You can imagine what swear words I used when told that the reason I had to surrender my RHD drive car was that it was too dangerous! I guarantee I was a safer driver in my UK car than 99.9% of Turkish drivers. The were also confused/bemused when I would stop to allow pedestrians to cross the road at a zebra crossing or to let cars out in front of me on a busy road. I have only been let out about 3 times myself in the 6 months here and some young Turks crashed into my car and did a runner when I mentioned police and sigorta (insurance) – was told they probably didn’t even have a licence never mind insurance! Love it Troy – Perfect way to describe it! 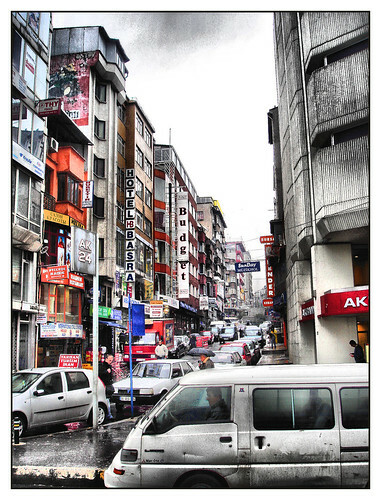 I have been driving in Istanbul for 2 yrs, and I am still alive to tell this tale ….. DRIVE at your own peril. In UK you assume all drivers are idiots… here you know they are …. driving here makes me smile laugh and get annoyed. everyone one is in a rush to get somewere but because the road system is crap the drivers are crap no one gets anywere fast , except an hospital ward. HI Ryan, Glad you liked the post. Best of it, the police are sometimes the culprits of bad driving as well! Hi Natalie – great post! I cracked up laughing. It seems that basically drivers in Turkey just seem to go out of their way to annoy others as best they can, before skilfully dodging the police for a laugh! After months of driving round INdonesia, I thought Europe had little to scare me. Now I’m thinking again. Great observations! One of the first things I’m sure we all take note of when visiting a new destination is the roads and driving. Every country is just a little, or a lot different. I especially loved your point #7 as the culture comes through – in the form of driving! Thanks Mehmet, Glad to know the big cities are better. I guess they have to be though as there are more chances of accidents. I have to admit that I refuse to drive in Istanbul, Izmir, Antalya or Ankara. I prefer my small little fishing village! Glad you like the new look! Hi Kim. You’ve seen the scooter pile up then.It is funny and then at other times, I think just pure stupid! Funny! I definitely can attest to all of these things being true. I love the roundabouts. Total chaos! And, the 5 person families piled on little scooters along with a large appliance that they just purchased was priceless! Hi Jen, I have removed your email address as you might get hit by spammers. I can see your address from the comment form though so sending you an email now. Natalie, can you email me privately? I have alot of questions I’d prefer not to ask on here. LOL. I put my foot in there didn’t I? Antalya does have a good bus system though! Antalya is where I am going! Scarey!!! Ah Jen. Give it a go if you find yourself in one of the small villages. I only refuse to drive in the big cities like Izmir, Antalya or Istanbul. Thanks Turkish Wine. Does good to have a humorous look at these things some time. Love this…I just tweeted it. No matter how many times I have been to Turkey and no matter how long I stay, I can never get up the nerve to drive. I live in Miami where the drivers are notoriously bad, but Istanbul takes the cake! great site! Ha ha I read your link stranger. Surprised to see that on the US embassy website. This was my favorite part. This is the revised driving briefing from the consulate. It’s not as funny as it used to be, but it’s still funny because it’s so deadpan. In the Ramazan warning at the bottom, they forgot to mention drivers turn into insane, angry arses (more than usual, I mean) because they’re grouchy from lack of food, tea, and cigarettes. The most terrifying time to be on the road is in the 30 minutes before iftar. Also, it’s okay to stop your car in the middle of the freeway to gawk at something, or to start a fight with another driver. Be sure to bring your tire iron! It’s also okay to make your wife drive even though she has no training or license. Let’s not forget pushing your children out ahead of you when you want to jaywalk on a busy street or on the freeway. Hanging CDs make attractive interior car decorations because they reflect the sun and blind other drivers. Oooh, shiny! Most importantly, in any sort of inclement weather, it’s totally okay to completely forget how to drive.